Today Nikon announced that they have a new lens for the Nikon DX format. About 7 years ago Nikon introduced almost the same type of lens with a focal length of 18-135mm, but it is retired product. The older lens is a lens that gotten a bit good deal of not so good reviews and it is the third worst reviewed lens in the Nikon DX standard zoom range. 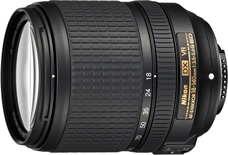 It the last couple of years Nikon has produced some great lenses, so this good very well be one of them. Looking at the specs for the lens, there are only minor differences from the old 18-135mm lens with a bit more glass in the new lens, which also means that the new 18-140mm lens is a bit more heavy (490g vs 385g). The biggest difference from a spec point of view is that the VR in the lens gives you 4 stops, where it only gives you 3 stops in the old lens. When you look at what the lens is up against it is the great 18-105mm from Nikon and the 18-200mm also from Nikon as long as you want a clean Nikon setup. There are third party lenses also on the market, but here you have to watch as not every lens has the high standard as Nikon normally does. It clearly that Nikon feels a gap with the new lens. The 18-105mm lens is currently priced at about $400, the 18-200mm at about $850, so here the 18-135mm fits nicely with a price about $600. Until we see any reviews of the new lens it is hard to recommend which to go for, but my initial thoughts are to go for the 18-105mm. It is a great lens for the price.